Welcome to the third and final preview for the Crossover 2018 Issue for the VS. System 2PCG! As promised we are going to be showing you only one card. And it’s a doozy! But first, some backstory. I was born in the summer of 1976, on a cool but sunny New England day, at 9 in the morning. For my first year, I didn’t do much, just sort of laid around really. But it was in my second year that I made a startling discovery; the Phoenix Force — a cosmic entity, a fundamental force of life and light. It is one of the most powerful entities in the universe and it has bonded to many different hosts over the millennia — most notable of which, on Earth at least, is Jean Grey. When bonded with the Phoenix Force, she is better known as the powerful Phoenix! But while Jean’s mind is one of the strongest in the universe, she is still human (well, homo superior). Which brings with it all the nobility but also the flaws of that species. And although the Phoenix Force is nigh-omnipotent, it isn’t immune to the power of human emotions. These emotions have the ability to twist the Phoenix Force into something bent on death and destruction, instead of life and light. When this happens to Jean she becomes…Dark Phoenix! +1/+1 and -1/-1 counters: Remove all of those counters from the game. Remove the phrases “+1/+1 counter” and “-1/-1 counter” from all card text. For the rest of the game, ignore any effects that would cause these counters to enter the game in any way. (such as a face-down resource or an equipment that has become a character via Arnim Zola’s ESP Box). Remove the term “equipment” from all card text. For the rest of the game, ignore any effects that would cause equipment to enter the game in any way. Keyword text: Removing this concept doesn’t affect [FLIGHT] and [RANGE]. Remove all keyword text from the game, including powers that “can’t be turned off”. Remove the term “keyword” from all card text. For the rest of the game, ignore any effects that would cause keyword text to enter the game in any way. Levels: All main characters everywhere become Level 1 if possible. Remove all remaining Level 2 and higher main characters from the game. Remove all Level Up powers and XP from the game, and the terms “Level” and “XP” from all card text. Ignore any effects that would cause XP or a Level 2 or higher main character to enter the game in any way. Plot Twists: Remove all plot twist cards everywhere from the game. This includes all decks, hands, KO piles, and plot twists that are already removed from the game. This also includes any cards that were once plot twist cards but are not currently plot twists (such as a face-down resource). Remove the term “plot twist” from all card text. For the rest of the game, ignore any effects that would cause a plot twist to enter the game in any way. Super Powers: Remove all super powers from the game. Remove the term “super power” from all card text. For the rest of the game, ignore any effects that would cause super powers to enter the game in any way. So, as you can see, she is pretty thorough. But you can’t say she’s not fair – she affects all players and sides. 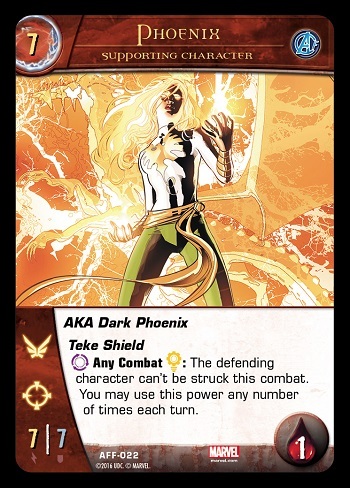 She is clearly very powerful, with only one obvious weakness – she can’t appear if your main character is Dark Phoenix. 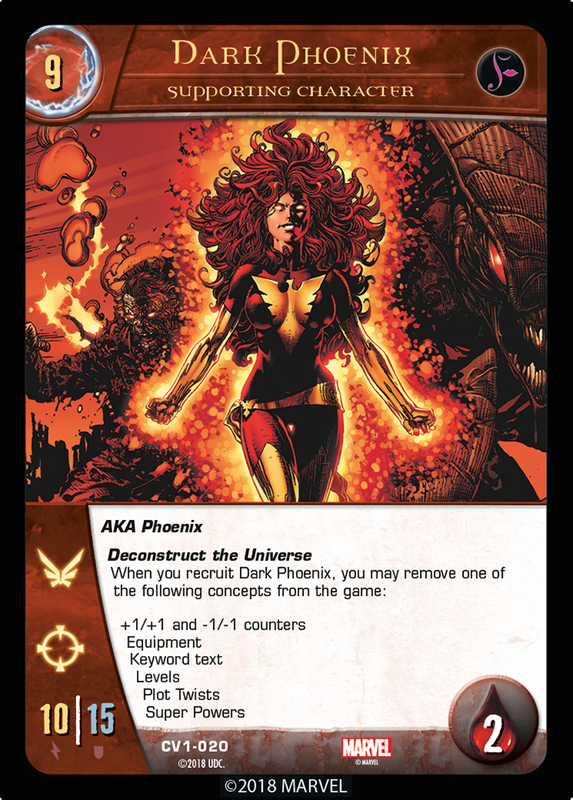 We hope you use Dark Phoenix wisely and justly in your future endeavors. But we won’t hold our breath. Well, that’s it for our Crossover 2018 previews – the cards hit stores December 19th 2018. Enjoy! I like the game very much “Phoenix”. I used to play all the time and the information which you have mentioned in the above is very useful for the game lovers. Thanks for sharing.